Shopping for Guardians of the Galaxy Pin Mates? 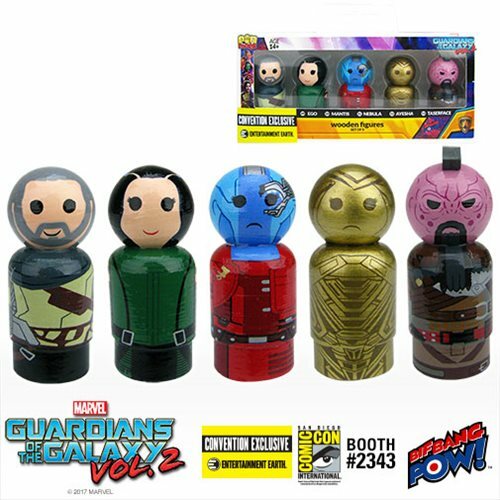 Unique Pin Mate™ set celebrating Ego, Mantis, Nebula, Ayesha, and Taserface from the movie Guardians of the Galaxy Vol. 2. Numbers 49-53 in the series! Collectible wooden figures created in 2-inch scale. Capture the action and excitement from the movie Guardians of the Galaxy Vol. 2 with this unique Pin Mate™ set from Bif Bang Pow!. Designed in a retro-style, these 5 miniature wooden figures are designed with intricate 360-degree artwork that includes hand-painted details alongside limited decal artwork, which showcases each character in movie-inspired clothing. Each character is crafted in 2-inch scale and has a unique number within the series on the bottom of the figure (as well as on the packaging): Ego (#49), Mantis (#50), Nebula (#51), Ayesha (#52), and Taserface (#53). Plus, as a convention exclusive, each limited edition set is individually numbered on a holographic sticker. Second Guardians of the Galaxy Vol. 2 Pin Mate Set Heads to San Diego as a Convention Exclusive!